Besides a bit of a polish and a soundtrack change, this new trailer for suburban cannibal mystery Elfie Hopkins, starring Jaime and Ray Winstone, is pretty similar to the one we premiered a few months back. Still looks dark, still looks great. Set in a sleepy hunting village, Elfie Hopkins is the story of twenty-two year old slacker and "wanna-be" detective. Elfie is a stoner and an animal lover in a village populated with hunters. Haunted by the death of her mother and surrounded by her broken father and alcoholic step-mother, Elfie seeks solace and inspiration from the old school detectives in The Maltese Falcon and Chinatown. She entertains herself, along with her geeky best friend, Dylan, by investigating the villagers and upsetting everyone with their imaginative allegations. Elfie's mundane existence is thrown for a spin with the arrival of a family of trendy city dwellers, the Gammons. The Gammons weave tales of adventure and entice the villagers with offers of exotic hunting holidays around the world. It's not long before the villagers are flying off to the four corners of the world. Elfie, despite her best efforts, is not immune to the Gammons charms, but soon smells a rat. Elfie and Dylan snap into detective mode and investigate the Gammons life. Blood soon starts to spill in the village and it's no longer just the blood of animals. Elfie discovers the villagers are not making those flights and when she finally uncovers the truth, its darker then she could have ever imagined. The Gammons are a family of cannibals!. 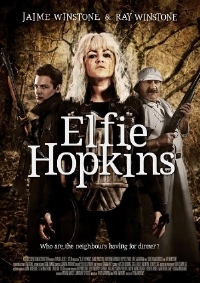 Elfie Hopkins stars Jaime Winstone, Ray Winstone, Kimberley Nixon, Kate MacGowan and Rupert Evans.